Adult Back tree monitors are completely black in color, while young offspring tend to exhibit lighter shades of green. Like other monitors, Black tree monitors have long, sharp claws and strong jaws. Their teeth are longer than the other monitor species, which enables them to hold on to prey they catch high up in the canopy. They are often sold as pets and do well in captivity with a heat lamp, as long as temperatures maintain 85 degrees Fahrenheit, with a basking temperature of 100-110 degrees Fahrenheit. Black Tree Monitors are carnivorous(meat eaters). In the wild, Black tree monitors eat snails, grasshoppers, beetles, scorpions, birds eggs, fish, other lizards, snakes, nestling birds, and shrews. 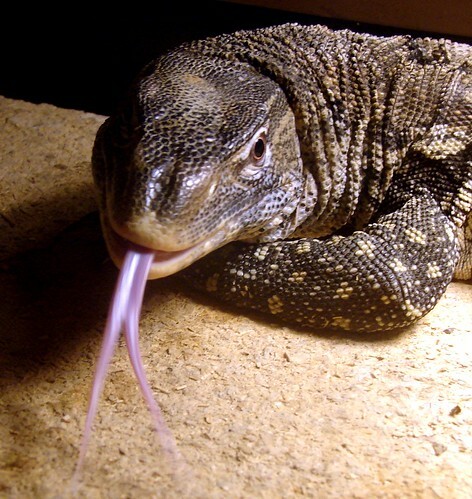 In captivity the Black tree monitor eats crickets, roaches, mealworms, ground turkey and cat food. Social Structure: When threatened monitors inflate their neck and hiss at an intruder. Their ribs may spread out a bit as the monitor takes in air to inflate its body. This makes the monitor appear larger to its enemy. Unlike other monitors, the Black tree monitor does not use its tail to lash at intruders. The black tree monitor is very quick and agile and can often escape its enemies by rapidly climbing trees. They may resort to biting and clawing, as a means of defense if their escape is not successful. Monitors are daytime lizards and spend most of their days living in treetops or swamps in search for food. 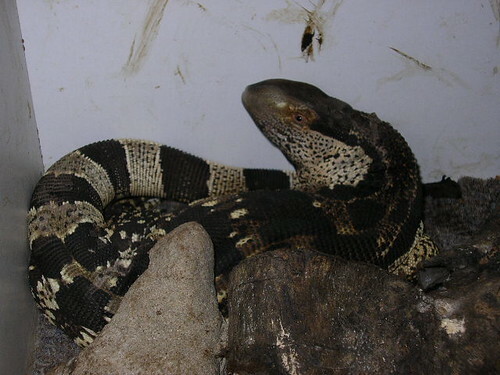 Senses: Black tree monitors, like all reptiles, are ectothermic (cold-blooded animals.) They have leathery, dry skin and are unable to produce their own body heat, so they must rely on basking in the sun for warmth. Monitors have excellent eye-sight and can sense movement from as far as 250 meters away. They also have a tongue like a snake. This fork-like tongue provides them with the superior sense of smell by bringing sent particles into their mouth, so they are able to taste what other animals can only smell. This special sense allows monitors to locate food, a mate, or an enemy. This black monitor is one of the few monitor species with the ability to use its tail as a fifth limb. Closely related species are V.prasinus, V.boehmei, V.bogerti, V.keithhornei, V.macraei, V.telenesetes and V.reisingeri.